The CATS Blue Line Extension project, managed by the City of Charlotte Public Transportation Department, continues around campus and toward Center City. Recently, preparations for the light rail to swing onto campus have begun. Trees across from Miltimore Hall are being removed to accommodate rail tracks and the station that will serve the University community, when it opens in mid-2017 (based upon the current construction schedule). Once the campus station opens, University leaders anticipate re-planting trees where possible, without obstructing the rail lines. Erosion control measures will be deployed, and a haul road will be built to divert construction vehicles off campus roadways. 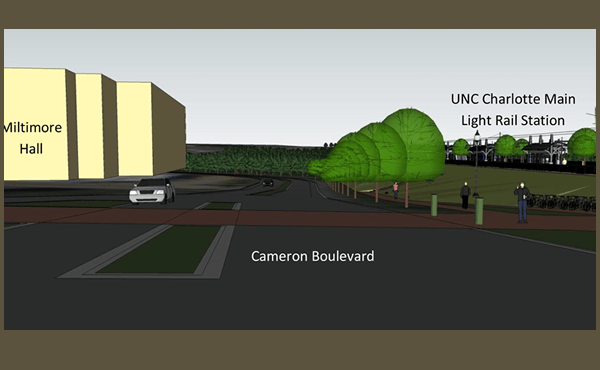 Once the UNC Charlotte Main Station opens, members of the campus community will be able to reach UNC Charlotte Center City in approximately 20 minutes, while avoiding traffic congestion and additional parking costs. Updates about the Blue Line Extension are on the Charlotte Area Transit System (CATS) website. Image is a conceptual rendering.